Location, Location, Location! 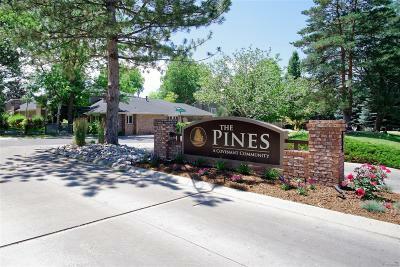 Live in The Pines in a fully updated rare ranch style end unit townhome. Completely updated kitchen with stunning finishes. New custom cabinets, built in oven, built in microwave, Quartz countertops, fireplace, gas range & hood & new hardwood floors throughout main level. Light, bright, open floorplan with soaring ceilings. Gorgeous deck off the kitchen and family room that overlooks a stream and open space area. Peaceful & serene. The Pines is centrally located & close to shopping, restaurants, grocery stores, Greenwood Athletic Club, I25, parks, Highline Canal, & so much more. You can move in & enjoy your new home immediately, no stress of updating & remodeling. It has been done for you. The Pines is a unique & beautifully maintained enclave of just 16 homes nestled among three ponds, waterfall, lush landscaping & towering pines. Homeowners take pride in their homes and gardens. The community has social events throughout the year to stay connected.